This app takes the effort out of sms messaging. 4 great features for sms messaging on your iPhone. An unrestricted lite version is also available on the App Store. 1) Create contact groups so you can send text messages to these groups of contacts without having to add them to the message each time. 2) Create standard messages that you can reuse without having to reenter the text every time. 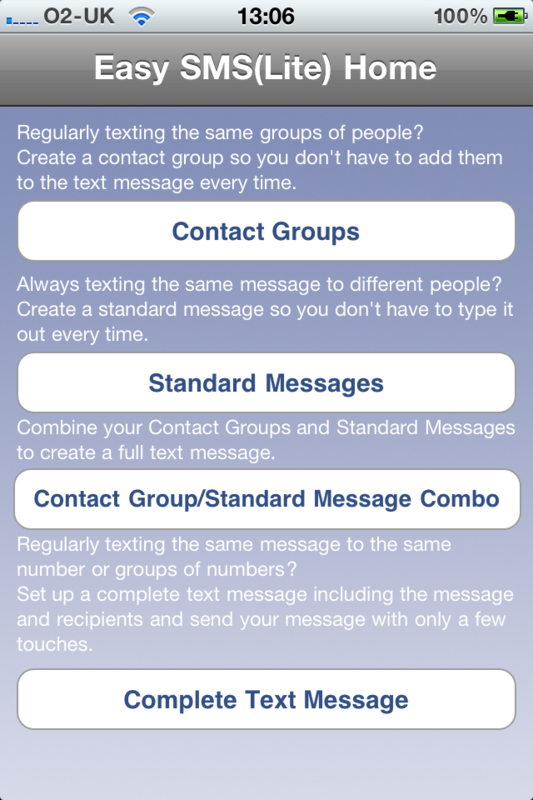 3) Create and save full text messages, including the message and recipient(s) for messages that you send regularly. Great for services like parking meter sms services, the congestion charge or any other service that uses sms messages. 4) Quickly and easily combine your contact groups and standard messages from above to send a message in just a few taps of the screen. Fed up of adding the same contacts into the messages app over and over again. This app is for you. Fed up of typing the same message over and over again every time you need to send it. This app is for you?